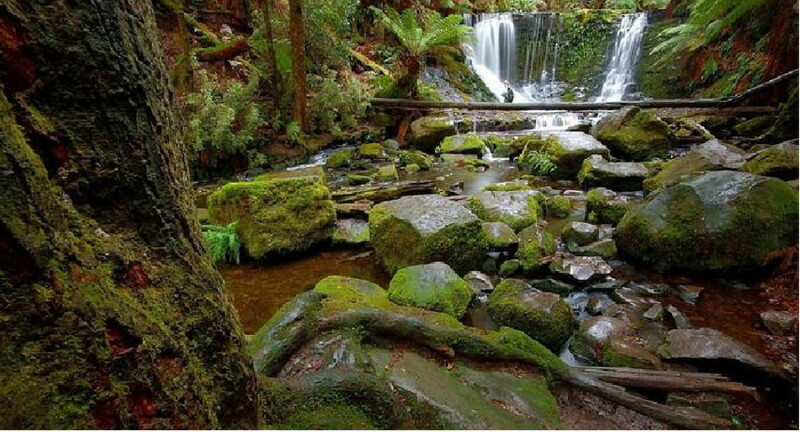 This beautiful scene is in Tasmania’s Mt Field National Park, a great place to experience the beauty buzz. 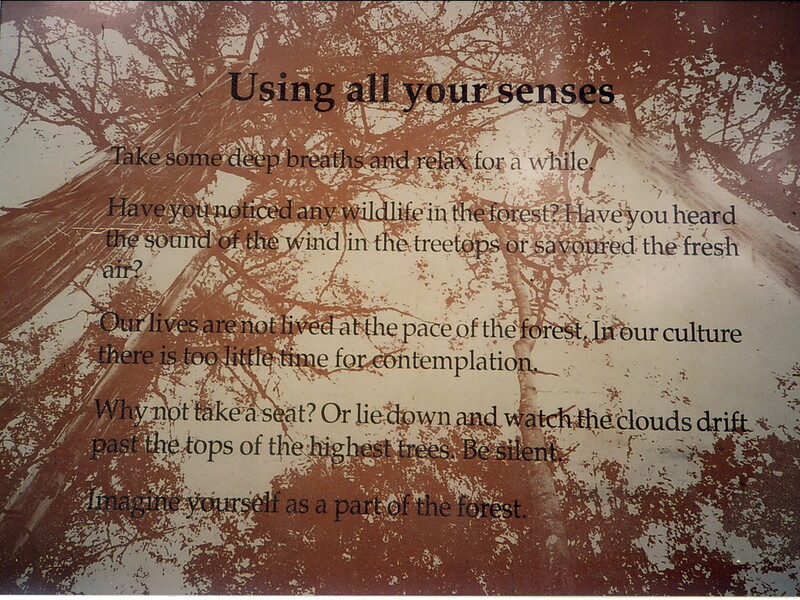 Not far from these falls, there is a magnificent forest of towering Swamp Gums (Eucalyptus regnans) where I came across this sign. The sign impressed me, not only because of its appropriateness for the setting (congratulations to the people responsible) but also because of its broader message about how to respond to natural beauty – we should “savour” it. Be absorbed: Go with the “flow”. Stay with your feelings and try not to think about what is happening and why. Dwell in the moment and be aware of your oneness with the object of your contemplation. Ignore the presence of others and shut out distracting thoughts. Don’t rush for the camera – give priority to making a “psychological” record rather than a photographic or electronic one. Sharpen perceptions: Accept aesthetic pleasure’s implicit invitation to discover more. Let your attention take you deeper into the experience. Observe mindfully – listen, taste, feel, smell as well as look. Follow Rachel Carson’s suggestion to focus as if this is the last time you will have the experience. Build memories: After allowing time for absorption, take a photo, make a sketch, write a diary or journal entry. Reminisce about your experience with a friend. If appropriate keep a physical souvenir (a pebble, feather or leaf, for example). As the sign gently hints, we need to surrender ourselves a little more to the tempo of the forest and make time in our busy lives for contemplation and savouring. The beauty buzz is usually more than a transient feeling of pleasure. It can be what psychologist and happiness guru, Mihaly Csikszentmihalyi (pronounced “cheeks-sent-me-high”) calls enjoyment – to distinguish it from sensory or “surface” pleasures of the kind we have drinking a good espresso coffee, for example, or having a shoulder massage. Enjoyment or “deep” pleasure leaves us with a sense of fulfilment or of having experienced something that is mentally, emotionally and perhaps spiritually enriching. Enjoyment comes from being willingly and completely absorbed in an activity that we value. Csikszentmihalyi refers to this unusual investment of attention and loss of self-awareness as an optimal experience or a state of “flow”. 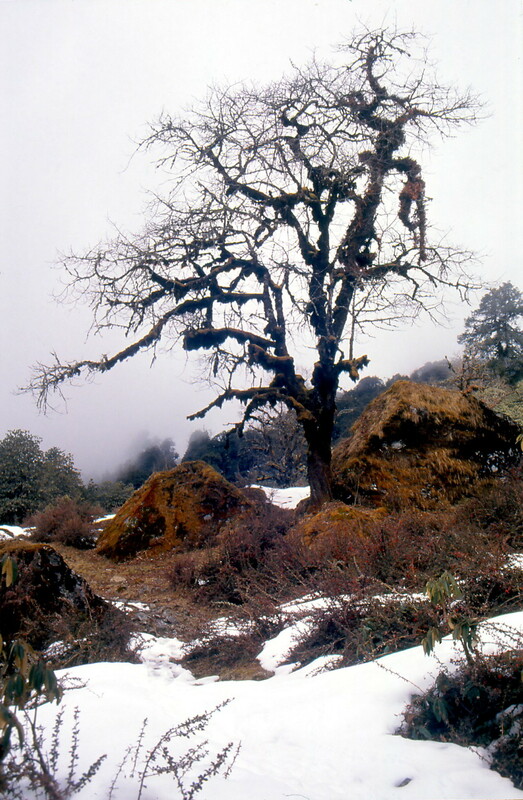 To be caught up in this state, he says, is to experience happiness. “High moments” and even many less intense forms of the beauty buzz are experienced as states of flow. Encountering natural beauty can leave us feeling that something of quality and worth has entered our lives – that we have been involved with something “wholesome” and fulfilling. This is fulfilment not of the kind that is linked with success or accomplishment but of a different type altogether. This is fulfilment that comes from being in the presence of greatness or excellence. Fulfilment of this kind makes us feel better about ourselves. “After an enjoyable event”, says Csikszentmihalyi, “we know that we have changed, that our self has grown: in some respect, we become more complex as a result of it”. Csikszentmihalyi links enjoyment and happiness directly with aesthetic pleasure (the beauty buzz). 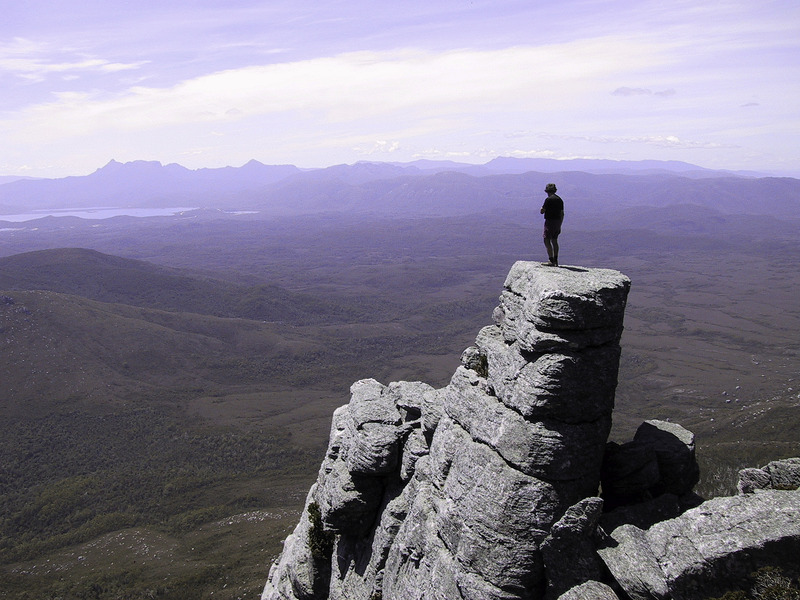 A wonderful view can provide an experience of “extreme joy, a moment of ecstasy”, he says. All of our senses can tap into the beauty of nature but Csikszentmihalyi singles out “seeing” for particular mention, making the point that we are prone to overlook the potential of vision to provide optimal experiences (or high moments). We need to cultivate the skills of visual contemplation because these “provide constant access to enjoyable experiences”. 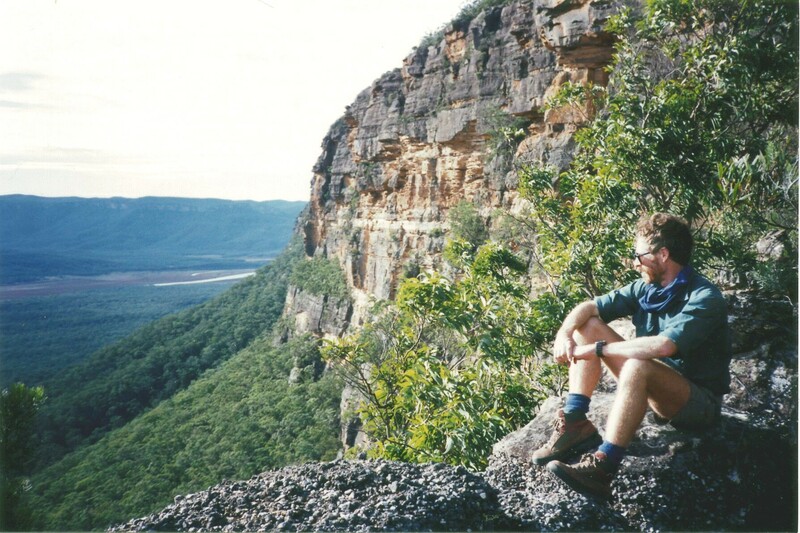 Here are my long-time bushwalking friends, Ron and Warwick, contemplating some “spekky views” (Warwick’s words). I suspect that were having moments of deep enjoyment (happiness) as well.